I love Old Navy!! I try to shop there whenever I am near one. I love being able to go online and print out a store's coupons to take shopping with me. The boys are looking great by the way! Pierce does look like a fashion model for jeans and shirts. So cute. I like their clothes. Old Navy has some great deals and cool style! I still shop some at Gymboree. I pretty much only shop there for Mica, so I can hand down whatever I buy to Isaak. Target isn't too bad as well. I like Crazy 8 now that we have one. I bought for next year at Children's Place. Usually I dislike their boy's selection. I don't mind their baby stuff. You got some great deals, and the boys look so cool and cute! old navy is awesome! and classic! I used to love Old Navy when me kids were younger... especially their t-shirts. I wish blogging had been around when my kids were young! Thanks for the tip on Clever Girls! I love the dino shirts! What a great deal of clothing you were able to get. Good old OLD NAVY. The best part of this post is your darling son's expressions. So cute!!!! 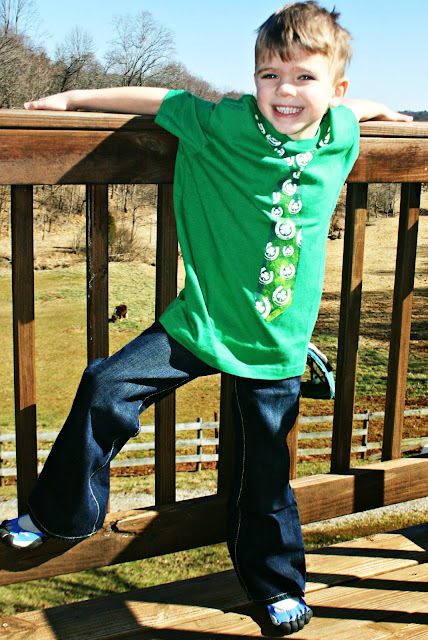 It's our go-to store for boy clothes, too! You have some future fashionistas here! Love the great big smiles that go with the new clothes. They look so cute! I do love Old Navy and have several favorite items from there. The jeans I wear the most are from Old Navy and I have some cardigans and sweaters from there that I really like. I love Old Navy! I've gotten many things there for both Amy and me. Pierce is getting so tall! All three of your little guys are such cuties!! They ARE a really nice store, the nearest one to here is in Charlottesville. I used to shop there quite a bit, and Anne Marie usually dons Old Navy quite a bit. I LOVE all three pictures of the boys! I love to go when they are having their clearance sales. I usually load up then. Old Navy was out of my budget when my kids were little (25 something years ago)... but your boys look great! ooohhhh those boys look so handsome! The boys look adorable in their new duds. I don't shop at Old Navy but some of my kids buy their stuff from there. Looks like some great bargains. They look so cute in their shirts! I haven't been to Old Navy in many years. We don't have one here. I don't and we have to drive a ways to an Old Navy, but the Mrs. does enjoy the deals there; especially for older boy's clothes. 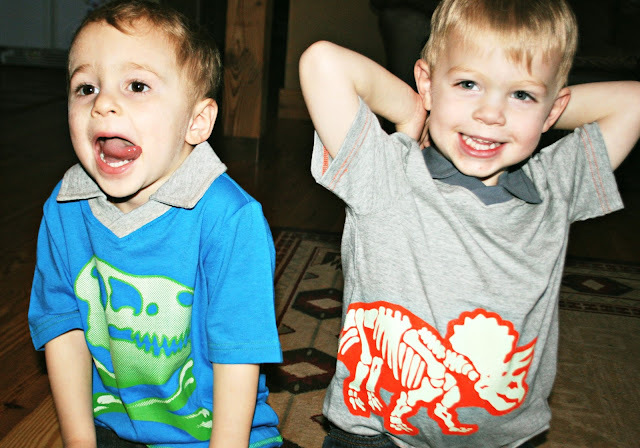 They look great in their dinosaur shirts. Those jeans do fit Pierce well. I do not shop often at Old Navy. Probably because the nearest store is a 45 minute drive. I hope you had a great weekend. Your boys are adorable!! Yup, I love me some Old Navy! We also have a huge consignment sale here that I participate in twice a year. 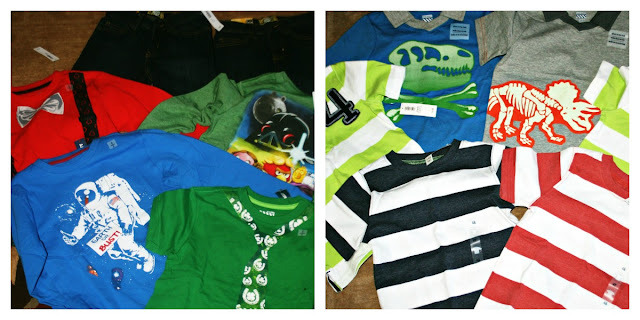 So whatever I earn I put back into kids' clothes. I love bargain shopping. I buy almost all my jeans from GAP, which own Old Navy or visa versa. I have long legs (36" inseam) and it is hard to find long jeans and GAP sells stuff online only for tall women. They aren't cheap but at least they are long enough! Your boys are so handsome! 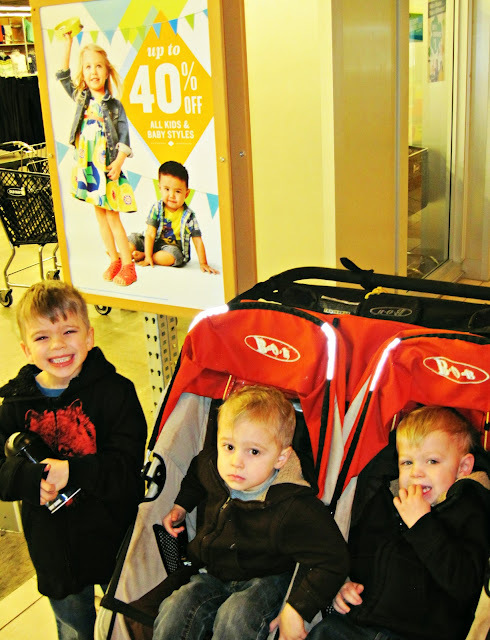 We love old Navy and I always use their online coupons. Love old navy.